This week the lovely people at Hagen Dazs were kind enough to send me some vouchers so I could try some of their great flavours for national chocolate week. My particular favourite was the belgian chocolate which is so delicious and indulgent. There is also another new flavor which fits perfectly with the recent trend for salted caramel. 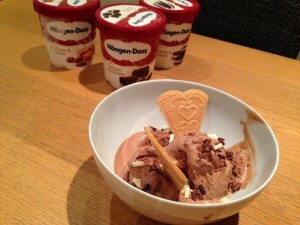 “Chocolate salted caramel” – yum! Other old favourites of mine and my husband’s are the cookies and cream and pralines and cream. 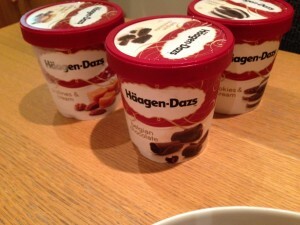 Basically we really really like their ice creams and will often have them on a movie night or lazy evening on the sofa. We inroduced our kids to the Back to the Future franchise this week, because last Wednesday was the day Marty Mcfly travels to in his future. The film skipped quite a few scenes we didn’t think were suitable for a 4 and 6 year old but my husband still loved sharing one of his favourite films with his children. The perfect type of family film to watch with icecream.